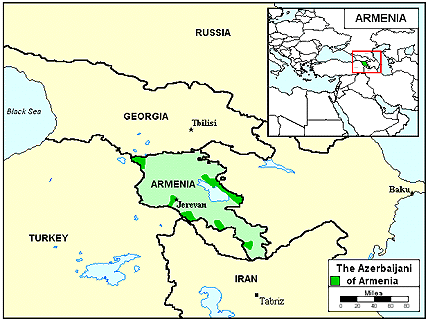 Present day Armenia is nestled between the nations of Azerbaijan, Iran, Turkey, and Georgia. Much of what is now eastern Turkey makes up historic Armenia. The battle between the neighboring Muslim Azerbaijani and the Christian Armenians has been long standing. When ethnic violence in Armenia erupted and reached a peak in the early 1990s, about 200,000 Azerbaijanis fled from Armenia to Azerbaijan. While the origins of the Azerbaijanis, (also known as the Azeri), are unclear, we do know that they have been subjected to numerous invasions throughout history. The homeland of the Azeris was first conquered by the Persians in the sixth century B.C. In the seventh century A.D., they were conquered by Arab Muslims and Islam was introduced. Although Armenians endured much persecution to maintain their Christianity, their Azerbaijani neighbors became Muslims. Azerbaijani settlements in the Caucasus were traditionally divided into makhelle, or villages, made up of extended families. Before Soviet rule in the 1920s, most Armenians worked as farmers or shepherds. However, under Soviet rule, Armenia became much more industrialized. Today, most of the people live in cities, and much of the traditional culture has undergone radical changes. Manufacturing and mining account for about two-thirds of Armenia's economic production, and most of the Azerbaijani are involved in industrial work. They usually live in apartments in the cities and enjoy a typical, cosmopolitan lifestyle. In an attempt to protect their Azeri culture, marriage within the family was encouraged. Unions between first cousins were considered the most desirable. Marriage to a non-Azerbaijani was almost unheard of prior to the Soviet period. Polygyny (having more than one wife) was only allowed in cases of infertility. The Azerbaijani diet consists mainly of rice pilaf and a variety of grilled and boiled meats including beef, goat, and lamb. Traditional dishes include bozartma (mutton stew), dovga (a soup made from yogurt), meat, and herbs. Tea and wine are popular drinks. The Azeri language belongs to the southwestern (Oguz) branch of the Turkic language family. 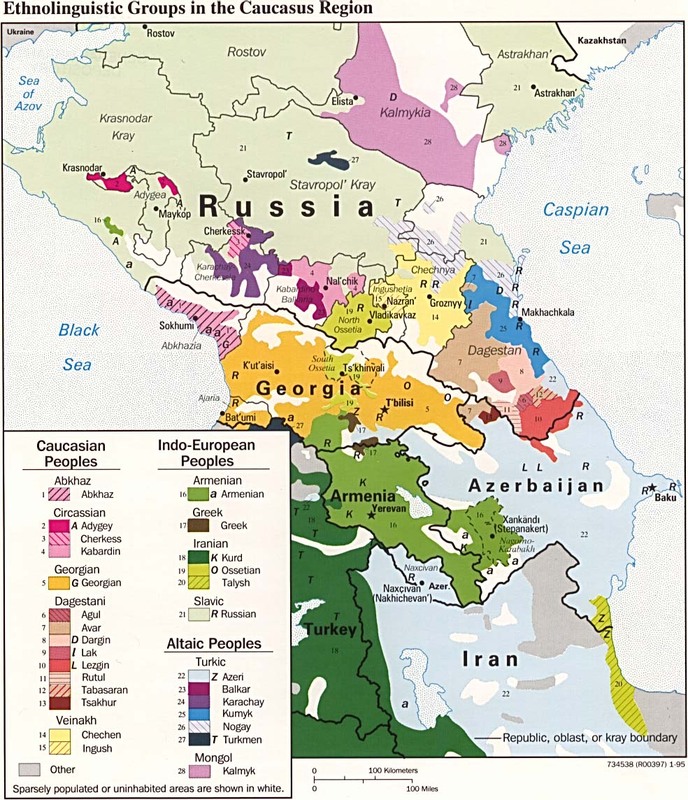 There are two main subgroups of Azeri: Azerbaijani North and Azerbaijani South. The main differences are in the sounds and basic grammatical structure of the languages. Azeri has a written tradition that dates back to the fourteenth century. Arabic script is used in Iran and the Cyrillic alphabet is used in Azerbaijan. A number of Azeri newspapers are published in Armenia to serve the needs of the communities. Armenia's Azerbaijanis are primarily Muslims of the Shi'ite sect, but there are a number of Hanafite Muslims as well. Twenty percent of the Azerbaijani in Armenia are non-religious. Islam among the Azerbaijanis is a reflection of historical ties that exist between Azerbaijan and Iran. Until the twentieth century, most Azerbaijanis identified themselves as Muslims rather than Azerbaijani or Turks. They believe that being a "spiritual community of Islam" was much more important than being a nation. Among the Azerbaijani, religious practices are less restrictive of women's activities than in Muslim countries. Many Azerbaijani women have jobs outside the home, and a few have attained leadership positions. However, some evidence of the traditional, restrictive female role remains. Although this small group of Azerbaijani lives in a predominantly Christian nation, the long standing bitterness between Muslims and Christians prevents them from receiving the Gospel. The Bible and the Jesus film are available in the Azeri language. * Ask the Lord to send long-term missionaries to Armenia to share Christ with Azerbaijanis. * Pray that prayer teams will be raised up to go and to break up the soil through worship and intercession. * Pray that God will open doors for Christian businessmen to share Christ with Azerbaijanis. * Pray for God to bring vision for outreach and a genuine burden for the Azerbaijani to Armenian believers. 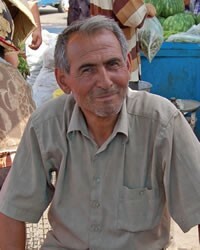 * Pray for God to give wisdom, favor, and strategies to missions agencies focusing on the Azerbaijanis. * Ask the Lord to raise strong local churches among Azerbaijanis.View Azerbaijani in all countries.